Below are common attributes associated to Tifblue Blueberry. Become a care taker for Tifblue Blueberry! Below are member comments regarding how to plant Tifblue Blueberry. No comments have been posted regarding how to plant Tifblue Blueberry. Be the first! Do you know how to plant Tifblue Blueberry? Below are member comments regarding how to prune Tifblue Blueberry. No comments have been posted regarding how to prune Tifblue Blueberry. Be the first! Do you know how to prune Tifblue Blueberry? Below are member comments regarding how to fertilize Tifblue Blueberry. No comments have been posted regarding how to fertilize Tifblue Blueberry. Be the first! Do you know how to fertlize and water Tifblue Blueberry? Below are member comments regarding how to deal with Tifblue Blueberry's pests and problems. No comments have been posted regarding how to deal with Tifblue Blueberry's pests and problems. Be the first! Do you know how to deal with pests and problems with Tifblue Blueberry? 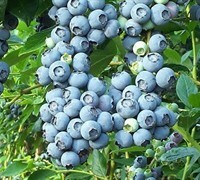 Get Tifblue Blueberry fresh and large directly from the grower to your garden! Buy Tifblue Blueberry online from the nursery wholesalers and save BIG! Rabbiteye blueberries are one of the few crops that require very special soil with a pH of 4.0 to 5.0. The plants will not live in soils with a pH above 5.5. It's best to test your soil for pH. You can do this yourself with a soil test kit or have your local extension service do it for you. In the absence of a soil test, to acidify your soil you can apply soil sulfur, aluminum sulfate or chelated iron. Cross-pollination is essential for blueberries. Plant three different varieties for best results. Orchard bees (a/k/a "Mason Bees") and bumble bees are extremely important. Small commercial growers should promote areas around their orchard for natural nesting to provide enough bees during full bloom to insure good cross-pollination. There are sources on the Internet where you can purchase everything you need to raise your own Mason Bees. I buy all my supplies from CrownBees.com. The feeder roots of blueberry bushes are very close to the surface and do not have root hairs therefore good soil moisture management and heavy mulches are important. Deep sandy soils are not good for blueberry bushes unless they are drip irrigated. Unmodified, heavy clay soils with poor aeration and little internal drainage will not do. In heavy clay soils you'll need to amend the soil with composted organic matter such as pine bark mulch (helps to acidify soil), mushroom compost or composted cow manure. If you are planting blueberries in low flat areas the beds should be raised to aid surface drainage. If you are tilling or turning the soil in the planting area, work organic matter as thoroughly and as deeply as possible into the planting spot prior to planting. When planting individually in non-tilled ground, dig the hole three times as wide as the root ball and mix in organic matter into the soil removed from the planting hole at a 50/50 ratio. When container-grown plants are used, loosen roots in root ball before planting. Set the plants on rows 10 to 12 feet apart and space plants no closer than 6 feet apart within the row unless you want a hedge for limited space. Water deeply after planting and apply a 2 inch layer of pine mulch or a 4 inch layer of pine straw. Then water enough to keep soil damp but not wet. Wait to prune young blueberries until their fourth year. After establishment, Rabbiteye blueberries require little pruning until they reach about 6 to 8' in height. At this point, a cane renewal pruning program should be started. Remove one to three of the largest canes each winter at 0 to 24" from ground level, or a total of about 20 percent of the canopy. Over a period of five years the bush will be totally renewed. New, more productive canes will sprout from the old canes and will sprout below ground level. In addition, excessively tall canes can be pruned back to 6 to 8 feet each winter. In general, judge the amount of overall thinning needed by the size of the berries. If the berries have been small, prune more heavily the following dormant season. If large, limit pruning. After planting a blueberry bush, and new growth begins to emerge in Spring, apply a granulated organic fertilizer at rates recommended on package label. Refertilize at the same rate in May and July if rainfall or overhead irrigation has been good. Spread the fertilizer evenly over a circle 18" in diameter with the blueberry plant in the center. Repeat this same fertilization process in March and July of the second year spreading fertilizer over a circle 24" in diameter with the blueberry plant in the center. Never over-fertilize blueberry bushes as too much fertilizer damages them easily. From the third season on, base the amount of fertilizer applied on the size of the bushes. Spread the fertilizer evenly under and around the bushes. Continue to increase the amount of fertilizer applied yearly until the bushes are 8 feet tall. Water the plants throughout the growing season when rainfall is not adequate. Irrigation of young plants is especially important. Adequate water is essential for plant growth and important for fruit bud formation that occurs in the fall. I've seen no pest or disease problems on rabbiteye blueberries. Consistently wet soils can cause problems. Plant in well-drained but moist soil.